Grzegorz Cisiecki (born Ryhor Cisiecki) is a 25-year old writer, screenwriter, and director from Belarus. His 2007 short, “Smoke,” is highly surrealistic, and pays homage during its 7-minute run time to everyone from Dali to Hitchcock to David Lynch. 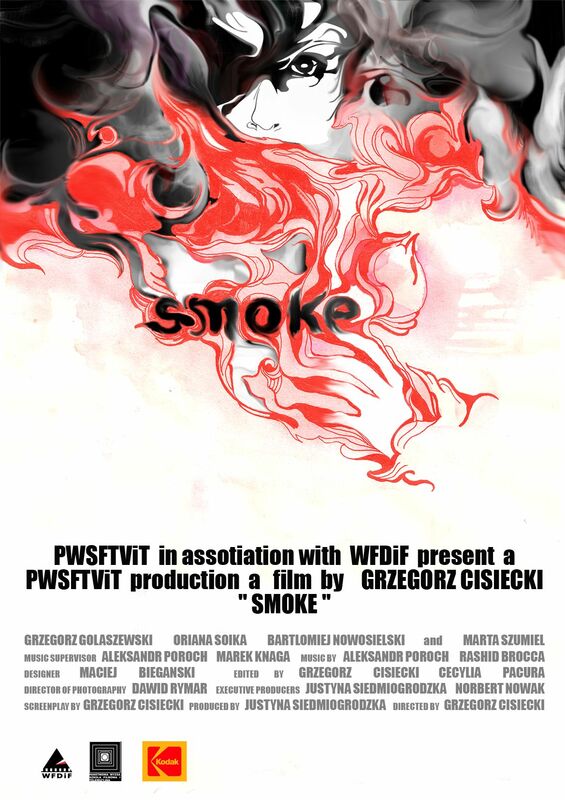 “Smoke” follows a young man, played by Grzegorz Golaszewski, as he appears to recollect several strange memories with the aid of a tape recorder. As with all Surrealist works, time is immaterial and difficult to grasp: it’s hard to tell if the man is remembering a series of past vignettes, seeing the future, or lapsing into some sort of dream state. Regardless, the quick-changing tableaux that Cisiecki treats us to are all visually stunning; the colors are lush, the editing judicious. Most impressive, however, is Cisiecki’s attention to sound. While there is little diegetic noise within the various scenes, the added audio is emphatic and unmistakable, and adds to the film’s feeling of (albeit unknowable) purpose. Though I can’t say what the film is “about,” I can say without hesitation that it is excellent. According to Wikipedia, Cisiecki recently worked with Clive Barker (of Hellraiser fame) on a script for a new project titled “Mister B. Gone.” Though IMDB reveals nothing of this project as yet, keep your eyes peeled for Cisiecki in the future. Already a published playwright and director of 6 shorts (“Smoke” being the most recent), his artistic vision holds great promise. Could he be the next Peter Greenaway? You be the judge! Daniel Alfredson, director of the second “Millennium” film (“The Girl Who Played With Fire”), has delivered again with the final installment of the Steig Larsson/Lisbeth Salander trilogy, “The Girl Who Kicked The Hornet’s Nest.” “Fire” ended with a cliffhanger: the never-say-die heroine, Salander, had just narrowly escaped another attempt on her life before being rescued by celebrity journalist Mikael Blomqvist. “Nest” picks right up in the middle of the action; Lisbeth is airlifted to a hospital where it soon becomes clear that both her supporters and her would-be assassins are all still hard at work. Chaos, albeit full of intrigue and adrenaline, ensues. If “Nest” moves a bit quickly and crams a lot of material into every scene, it’s really not Alfredson’s fault. The third novel in Larsson’s series clocks in at well over 500 pages, and it’s hard to imagine the adaptation being any more successful without vital material having been excised from the film. Even so, it can be rough going for those who aren’t familiar with the story. However, even with this glut of information to convey, Alfredson and writer Ulf Ryberg have managed to make some interesting changes to the story. They may seem like small details: the judge presiding over Lisbeth’s trial has been changed from a man in the novel to a woman in the film, and Blomqvist’s sister, the attorney who ends up defending Lisbeth and bringing the whole story to a close, is pregnant in the film, though not in the novel. It seems that, subtly, both writer and director are doing their best to carry out Larsson’s desire to tell a strongly feminist story while remaining politely cloaked in a run-of-the-mill mystery/thriller. At every turn, female characters pop up and fight the system, whether in the courtroom, the press, or face to face with would-be murderers. 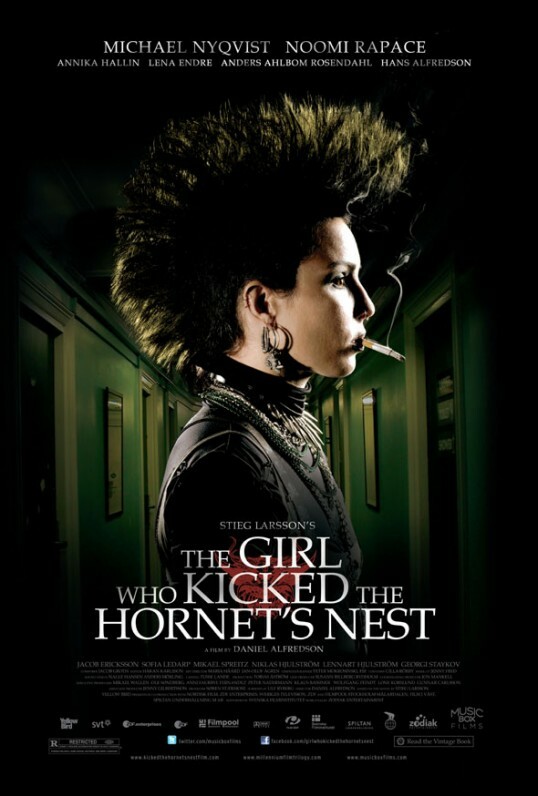 The effect is galvanizing, as is Noomi Rapace’s compelling performance, and overall, though it’s a bit rushed in places (despite its 2.5-hour running time), “The Girl Who Kicked The Hornet’s Nest” easily maintains the high standards of the previous two films. The films’ frankness about institutionalized violence against women, however, won’t fly so well in this country (the first novel, originally titled “Men Who Hate Women,” was repackaged in the US as “The Girl With The Dragon Tattoo”). And, inevitably, American remakes of the trilogy are already in the works – the first is slated to be released later this year, directed by David Fincher (“Fight Club”) and starring Rooney Mara (“The Social Network”). It very much remains to be seen whether the American contingent can match not just the excellent pacing and flawless story construction of the Swedish films, but whether they’ll have the brains and the guts to remain true to the heart of Larsson’s story. “The Girl Who Kicked The Hornet’s Nest” is currently available on DVD.